Lysol® Neutra Air® Sanitizing Spray in fresh scent eliminates bacterial odors at the source and in the air. It is unlike air fresheners that simply mask odors temporarily. This spray eliminates odors in the air and kills 99.9% of odor causing bacteria at the source*, so odors don't come back. Neutra Air® provides air so clean you can smell the freshness. It helps eliminate tough odors such as bathroom smells, pet odors, smoke odors, and food odors. It can be used as a sanitizing spray throughout your home or facility on hard nonporous surfaces such as toilet seats, desks, glass, bed frames, and bed springs. 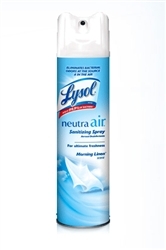 Lysol® Neutra Air® Sanitizing Spray eliminates Staphylococcus aureus and enterobacter aerogenes on hard non-porus surfaces. -To temporarily reduce airborne odor-causing bacteria and eliminate odors, close all doors, windows, and air vents. -Hold can upright, press button and spray towards the center of an average size room (12' x 12' x 9') for 10 seconds. -For maximum effectiveness, relative humidity should be between 45% and 70%. Resume normal room ventilation after spray has settled. -Pre-clean surfaces prior to use. -Hold can upright 6" to 8" from surface. Spray 2 to 3 seconds until covered with mist. -To Sanitize: Let stand for 5 minutes and allow to air dry. -Let stand for 10 minutes and allow to air dry. -Rinse all toys and food contact surfaces with potable water after use. -Allow to remain wet for 10 minutes. -Repeat applications in weekly intervals or when mold and mildew growth appears. -Do not use on polished wood, painted surfaces, leather, rayon fabrics, or acrylic plastics. -Does not harm most bathroom surfaces. -For other surfaces, spot test in an inconspicuous area. -Do not use on utensils, glasses and dishes.